1. 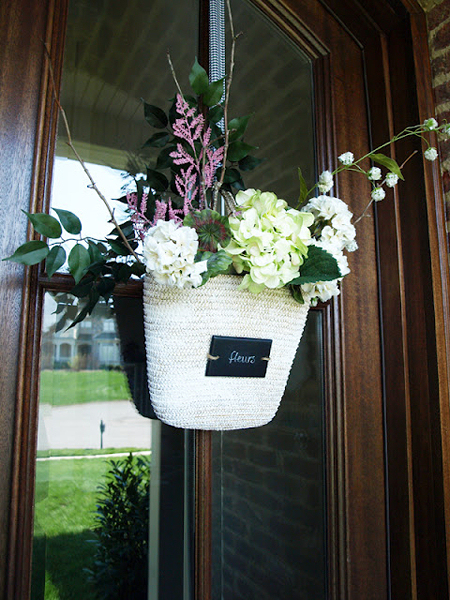 Fill an inexpensive straw tote with flowers. 2. 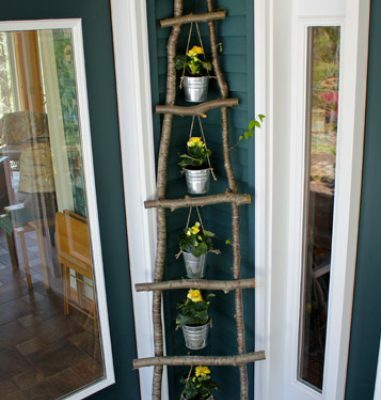 Fill an umbrella with flowers or colorful branches. 3. 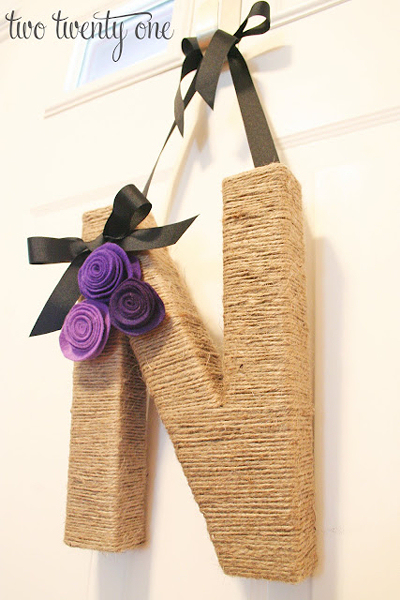 Add a fancy jute-wrapped, embellished monogram to your door. 4. 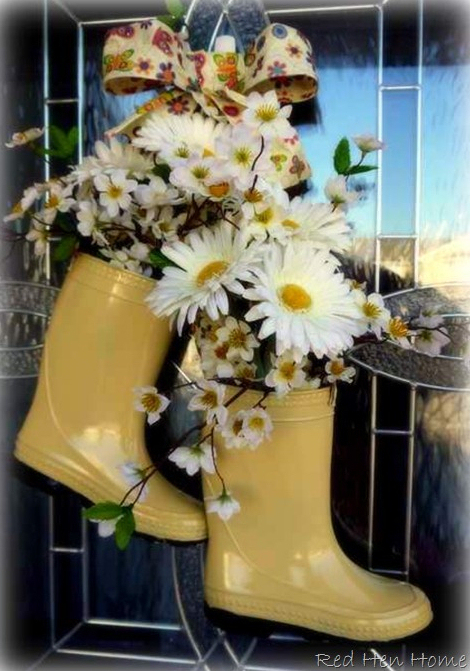 Fill some rain boots with pretty flowers. 5. 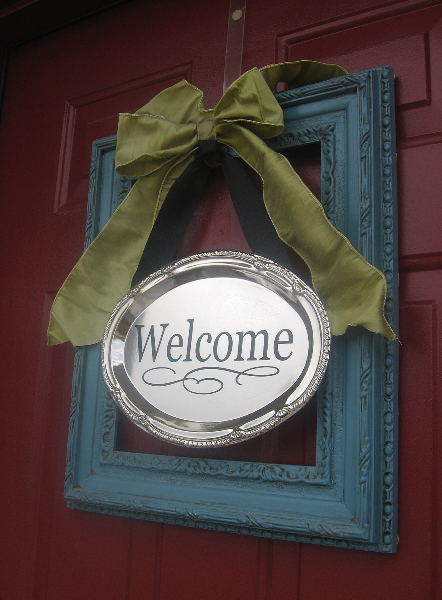 Use a pretty painted frame to create a “welcome” sign. 6. Create a spring mixed media collage on canvas. 7. 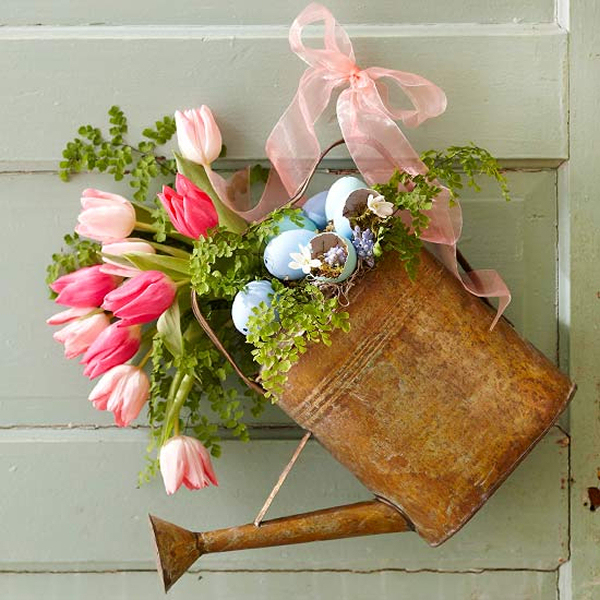 Fill an old watering can with flowers. Watering can filled with flowers used as door decoration from BHG. Aren’t those great ideas?! Yes, there are door decorations beyond the traditional wreath! Have you made (or come across) any other fantastic wreath alternatives? 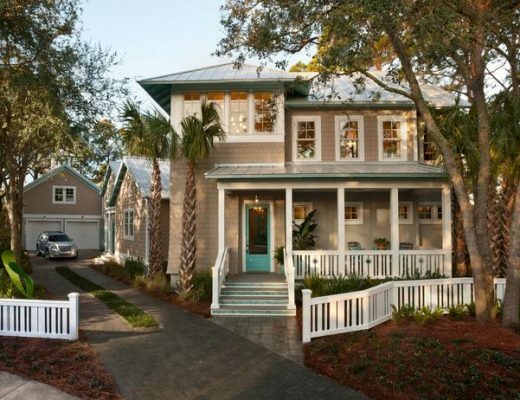 Come Tour The 2013 HGTV Smart Home With Me! Thanks for including my umbrella wreath Kristi! I love that watering can!!!! These are all so cute, but need covered doorways. My front door has no roof, portico, shelter or overhang for protection, so whatever I put out there has to be able to handle the weather. Maybe collect and share some ideas that can deal? 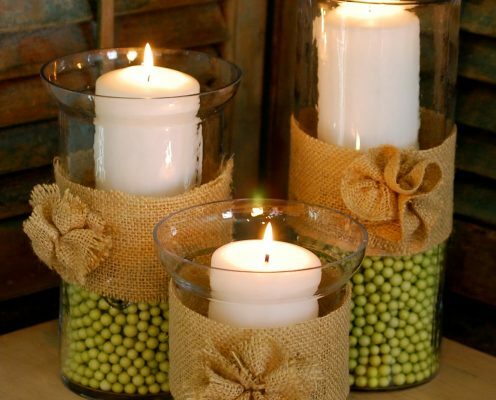 Beautiful ideas! I love them all! They are all great ideas! I think Korrie’s boots are just the cutest and I love Kelly’s umbrella as well. I used a flat basket filled with dried basil this year and love the way it turned out too. This is some great pinning material for next year! I have a store bought wreath on the front but I am gonna try the welcome frame idea i love it thanks for the idea! All so beautiful, but I tell ‘ya, i’ve been thinking of two since I first saw them… the umbrella from Eclectically Vintage, and the boots from Red Hen Home. I’m thinking about combining the ideas…. filling boots with water like the umbrella and putting fresh flowers in. Hmmmm…I’ve been trying to come up with something besides a wreath myself….no good ideas yet. I really like the straw tote with flowers idea! Thanks for reminding us that different is good. All these are too pretty! I especially like the straw tote, and I think I can easily duplicate t hat. 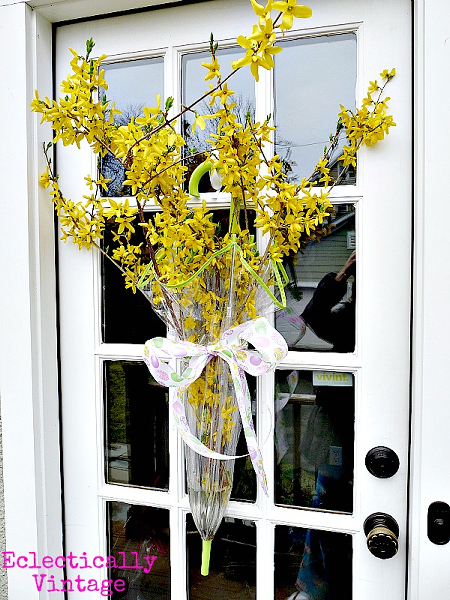 One question: Are people really willing to replace fresh flowers on their front door? Lovely ideas! That watering can is gorgeous. I’d love to find one that looks old and rusty like that. I think the rusted can with the bright and colorful flowers is what makes that arrangement look so beautiful. Thanks for the ideas! 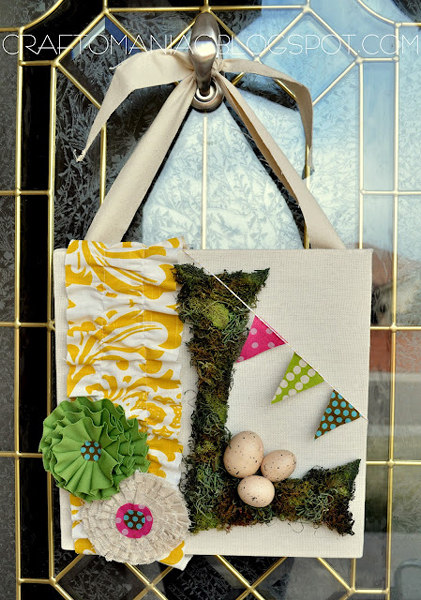 This is great inspiration to update the front door. Kiddies old gumboots is a cute idea!